Whomp whomp. There're no F91 "Gundam F91" (Harrison Madin custom)s for sale. 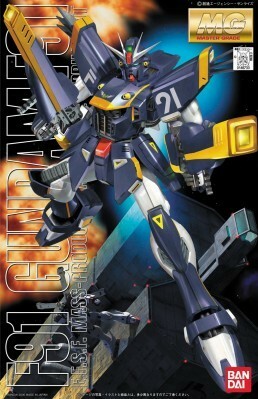 Basically a recolor of MG #87 with additional parts. Includes water-slide decals. This is not the best kit, it is cheap, so it has that going for it. If given the choice, the normal F91 is better, this one has a lot of stickers(most of the yellow trim), which is usually not acceptable for Master Grade kits. The articulation is just about on the level of the modern kits that are available. It should be noted that this kit has absolutely no polycaps, which causes the joints to be very tight(ABS plastic on ABS plastic), and the joints will become loose over time. The kit also comes with waterslide decals instead of rub transfers.